Creativity has no limits. Just look at how awards-winning artist Kai Chan created a mirage with silk thread and nails. To the master of colours, Pelin Yazar Cañez from Turkey, "I seek the emergence of bounded worlds that should glow with a simple, musical incandescence. I try to catch a glimpse of ecstatic magic through often benevolent commonplace objects, images, and animals set amid rough-hewn landscapes." Shamsi Shahrokhi, from Iran, pioneered an award winning technique called "Heat Drawing", where she creates images and shapes on heat sensitive papers without using conventional materials, but by applying heat to their surfaces. Ying-Yueh Chuang, a studio ceramist in Toronto, has exhibited her works worldwide. 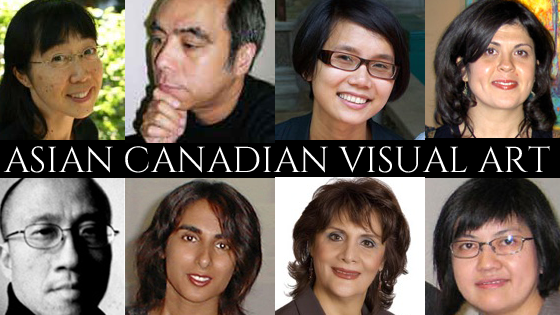 The Asian Canadian artists are connected both locally and globally. To Dr. Linda Saphan from Cambodia, "the issues raised by my art works depict the variety of today's culture and its fascinating, rich and complex appearance, which is both global and particularly local, endlessly repetitive and endlessly differentiated." The artists themselves are often cosmopolitan. In Manuel Lau's works, "the singular mixture of his cultural backgrounds - Peruvian, Chinese and Canadian - and his own personal story in each of these cultures have created a unique cycle of memories and experiences that have provided the context and inspiration for his works. The works of Shelly Bahl, a South Asian Artist, have been reviewed by New York Times as "A Collection Born of Cultural Dislocation."